Carr’s Agriculture division serves farmers in the North of England, South Wales, the Welsh Borders and Scotland, the US, Germany and New Zealand. The Engineering division offers remote-handling equipment and fabrications to the global nuclear and oil and gas industries. Once again, Carr’s diversified model has enabled it to deliver profit growth despite well-publicised issues in the UK agriculture sector. Pre-exceptional PBT grew by 4.5% to £11.4m as a flat result from the Agriculture division was enhanced by a year-on-year performance improvement in Engineering. Group H119 revenues rose by 3.0% year-on-year to £206.2m, reflecting commodity price inflation and sales from Animax, which was acquired in September 2018. Noting this resilience, we leave our estimates and valuation unchanged. Growth in the US feed block market and the Engineering division more than offset reduced volumes of feed, feed blocks, fuel and animal health products caused by the mild autumn and winter in the UK and lower revenues from sales of machinery. Machinery sales are linked to farmer confidence, which weakened recently because of continued uncertainty over Brexit. Net debt rose by £7.9m during the period to £23.3m. As well as the seasonal increase in working capital, there was £4.7m (net) paid out for Animax. Second-half performance is typically dominated by the Engineering division, as farmers require less feed and other inputs during the summer. Prospects here are positive as the order books for the UK manufacturing and US Engineering businesses are at record levels. Looking further out, the $8.5m contract won by the German engineering business in the US bodes well for awards from the US in the future and underpins capacity utilisation during FY20. Our DCF analysis gives an indicative value of 182p/share (unchanged). 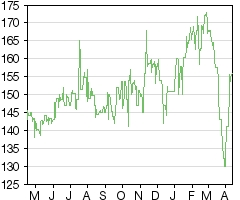 At the current share price, Carr’s is trading below its peers with regards to mean EV/EBITDA (6.5x vs 8.8x) and mean P/E (10.0x vs 14.6x) for the year ending August 2019. Carr’s share price dropped by 13% following Wynnstay’s profits warning in March, which was attributable to uncertainty over Brexit affecting UK farmer confidence, particularly over future lamb exports. Carr’s share price has completely recovered since then as investors have recognised how Carr’s more diversified business means it is less affected by factors influencing UK farming. Confirmation that Carr’s diversified business model can continue to address issues caused by Brexit uncertainty plus news of further Engineering orders should, in our view, help close the valuation gap compared with the mean. Source: Company data, Edison Investment Research. Note: *Excluding £0.2m loss attributable to JV. **Including £0.2m loss attributable to Engineering JV. As flagged at the AGM in January, US feed block volumes continued to rise as penetration of the eastern states of the US has increased following the commissioning of the low-moisture feed block plant in Tennessee in January 2018. Despite wetter weather conditions muting demand, volumes rose by 5.6% year-on-year. Mild weather in the UK and mainland Europe contrasted with much colder and wetter conditions during the same period the previous year and resulted in feed block volumes decreasing by 14.1% in the UK and 9.9% in mainland Europe (0.5% decline globally). Management mitigated the impact on profitability through improved efficiencies and better procurement. As flagged at the AGM, the mild, dry weather reduced demand for compound feed (volumes down 4.1%), fuel (volumes down 6.0%) and animal health products. Weaker demand for the latter affected the retail activity (down 5.5% like-for-like, 0.4% reduction including acquisitions). UK farmer confidence has taken a tumble since January, reflecting concerns about the likelihood of a no-deal Brexit. This has manifested as a 10.2% drop in machinery revenues, albeit against record high comparatives. As with feed blocks, management addressed these issues through a combination of improved efficiencies and good procurement, helped by supportive raw materials positions. Divisional revenues increased by 3.9% year-on-year, boosted by £3.1m revenues from Animax (acquired September 2018) and commodity price inflation. Adjusted operating profit (including profit from JVs) was the same as H118 at £10.0m. Looking forward, the division continues to perform in line with management’s expectations for the full year despite the knock to UK farmer confidence caused by the prolonged Brexit negotiations. The integration of Animax with its complementary animal health product portfolio is progressing well. 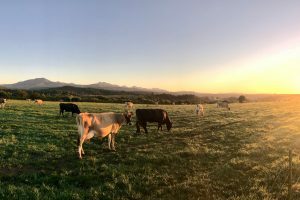 At this point in the financial year it is not possible to predict whether this summer will be a repeat of last year, when there was unusually high demand for feed because of the lack of forage caused by the prolonged drought. We therefore take the prudent view and model a small year-on-year drop in total JV profits during FY19. In the longer term, we expect divisional revenue to benefit from the formation of a direct sales operation for feed blocks in New Zealand and growing feed block sales in South America. We expect management to continue to make small acquisitions to add to the Country Store portfolio. These will be both within the existing geographical footprint and in adjacent regions where the offer is compatible. We do not expect significant expansion eastwards in the UK into predominantly arable farmland. The UK Manufacturing business performed well as it worked on a strong order book backed by long-term contracts from the nuclear industry and a buoyant oil and gas market. Importantly, changes in management in both the fabrication and precision engineering businesses helped raise profitability and delivered a significant uplift in the forward order book and opportunity pipeline. The recent $8.5m US contract for remote handling equipment from the German business demonstrates how working with NuVision (acquired August 2017) is securing access to the hitherto impenetrable US market. While the contract helps top up Wälischmiller’s order book following completion of the substantial Chinese orders in FY18, most of the revenues under the contract will not be realised until the manufacturing phase commences in FY20. NuVision’s own order book benefitted from two significant Mechanical Stress Improvement Process contracts won during the summer, which extend to FY21. Funding from the US Department of Energy to develop a small-scale working prototype of NuVision’s passive cooling technology, which is intended to prevent a repeat of the Fukushima tragedy, potentially opens a new product area longer term. The strength of the divisional order book, which is based on long-term contracts from the nuclear industry, indicates the division continues to perform in line with management expectations and the strong performance is set to continue during FY19. The extension of the German premises, which are now complete, provides additional capacity. Although Wälischmiller’s order book is weaker than last year following the completion of the substantial Chinese orders, management remains confident of securing further sales of German equipment in the US through NuVision’s sales channels. We note that Brexit uncertainty may be beneficial for the UK manufacturing businesses, which are seeing increased levels of enquiries from potential UK customers who typically source pressure vessels from mainland Europe. Net debt rose by £7.9m during the period to £23.3m. This is primarily attributable to a £7.3m increase in working capital requirements, which is the typical seasonal pattern; £1.8m capex, £4.7m payable for the Animax acquisition (net of cash) and £3.2m dividend payments. The retirement benefit surplus reduced from £10.1m at end FY18 to £6.8m at end H119. The group no longer makes deficit reduction contributions because the pension scheme was fully funded at the last full actuarial valuation. We leave our estimates unchanged from the minor revision following the prelims in November. These model a 2.5% year-on-year rise in group PBT (adjusted for share-based payments and amortisation of intangibles) to £18.1m in FY19. This is driven by continued growth in US feed block volumes, the Animax acquisition and a strong order book in the UK manufacturing businesses. We model net debt increasing by £6.1m during FY19 to £21.5m at the year end because of the consideration payable for Animax and the deferred consideration associated with the NuVision acquisition. Net debt then reduces to £14.8m by the end of FY21. We expect capital expenditure (which is included within ‘investment activities’ in our financial summary table along with purchase of intangibles) during the forecast period to be higher than FY18 (£5.0m in FY18, £4.5m in FY19 and FY20 vs £4.3m in FY18). This includes completion of the group’s Enterprise Resource Planning system. Our valuation methodology is based on a DCF analysis, supplemented with a comparison of peer group multiples. We continue to use a conservative 10.0% WACC and a 1.0% terminal growth rate for our DCF calculation. This gives a fair value of 182p/share (unchanged). The valuation gap should close once there is clarity on trading arrangements post-Brexit and news of further contracts to replenish Wälischmiller’s order book. Source: Refinitiv estimates, Edison Investment Research. Note: *Including JVs. Prices at 11 April 2019. Grey shading indicates exclusion from mean. In Exhibit 3 we compare Carr’s EV/EBITDA and P/E multiples for the years ended August 2019 and August 2020 with calendarised multiples for listed peers in the agricultural sector. At the current share price (153.5p), on our estimates (which are unchanged since the upwards revision following the FY18 results in November) Carr’s is trading below its peers with regards to the mean EV/EBITDA multiple (6.5x vs 8.8x) and P/E (10.0x vs 14.6x) multiples for the year ending August 2019. At the indicative value of 182p/share derived from our DCF calculation, Carr’s implied EV/EBITDA multiple for the year ending August 2019 is remains below the peer group average (7.6x vs 8.8x), as is the P/E multiple (11.9x vs 14.6x). This report has been commissioned by Carr's Group and prepared and issued by Edison, in consideration of a fee payable by Carr's Group. Edison Investment Research standard fees are £49,500 pa for the production and broad dissemination of a detailed note (Outlook) following by regular (typically quarterly) update notes. Fees are paid upfront in cash without recourse. Edison may seek additional fees for the provision of roadshows and related IR services for the client but does not get remunerated for any investment banking services. We never take payment in stock, options or warrants for any of our services.